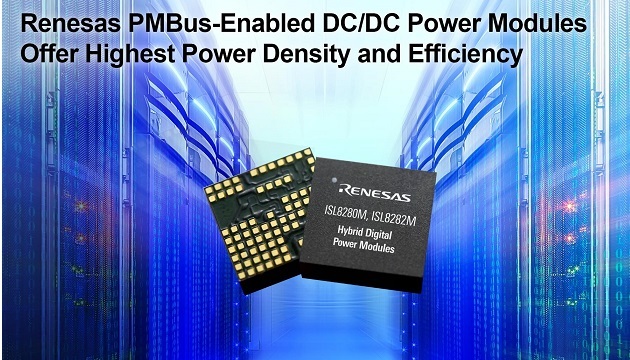 Renesas Electronics Corporation, a premier supplier of advanced semiconductor solutions, announced a pair of new encapsulated hybrid digital DC/DC PMBus power modules, the 10-amp ISL8280M and 15-amp ISL8282M. 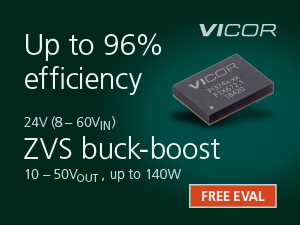 The hybrid digital power modules offer best-in-class power density of 115mA/mm2 in a 12mm x 11mm package, with up to 95 percent peak efficiency. They are complete single-channel, synchronous step-down regulated power supplies that operate over a wide input voltage range of 5V to 16V. Also announced are the new ISL8210M and ISL8212M analog power modules, offered in the same pin-to-pin compatible 12mm x 11mm package with 10A and 15A of output current, respectively. The hybrid digital and analog power modules provide point-of-load (POL) conversion for advanced FPGAs, DSPs, ASICs and memory used in servers, storage, optical networking, telecom, and a broad range of space-constrained industrial applications. Each device integrates a PWM controller, MOSFETs, and inductor inside a new thermally optimized, Grid High Density Array (GHDA) encapsulated module. 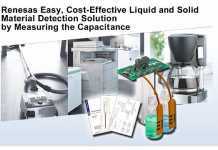 To complete the power supply, designers simply add input and output ceramic capacitors. 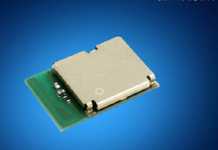 The ISL828xM hybrid digital and ISL821xM analog power modules feature integrated LDOs that enable single-supply operation. 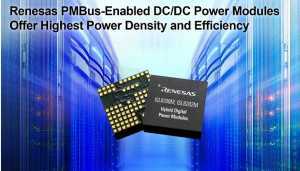 They leverage Renesas’ patented R4 high-speed control loop architecture with inherent line voltage feed-forward, providing designers a unique combination of ultra-fast load transient response and high noise immunity. 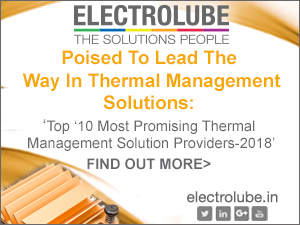 Their proprietary Grid HDA package offers unmatched electrical and thermal performance through a single-layer conductive package substrate that efficiently transfers heat from the module to the system board, and dissipates it without requiring airflow or heatsinks, even under heavy load conditions. 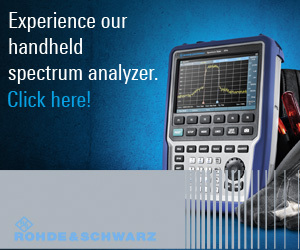 The PowerCompass tool helps users quickly identify the right power modules and other parts that match their specific requirements. 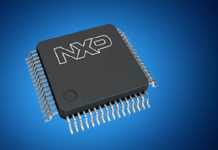 Multiple power rails can be set up for more than 200 FPGAs, and designers can perform high-level system analysis and generate custom reference design files in minutes. The PowerNavigator tool works with PMBus, allowing power architects to set up hybrid digital power module telemetry, sequencing, and run-time configuration, while each module’s pin-strap configuration allows for standalone operation. The ISL828xM hybrid digital power modules and ISL821xM analog power modules are available now from Renesas Electronics’ worldwide distributors. Renesas power experts will demonstrate the ISL828xM and ISL821xM products in Renesas’ booth #347 at the Applied Power Electronics Conference (APEC), March 18-20 in Anaheim, Calif.